For years, My Trio Rings has created collections featuring up to women’s size 13 and men’s size 16 rings. But we noticed other jewelers were not providing the same selection, and only narrow size ranges were available from traditional retailers. We saw this is a great opportunity to better serve all of our customers – and shake up an industry that desperately needs an update. “The Full Brilliance collection has evolved as we’ve gotten a lot of feedback from different couples,” said Vipul Lakhi, Chief Executive Officer. “We’ve heard over and over that people aren’t able to find rings in their size when they go to jewelry stores. So we started crafting rings just for sizes 11 and up. 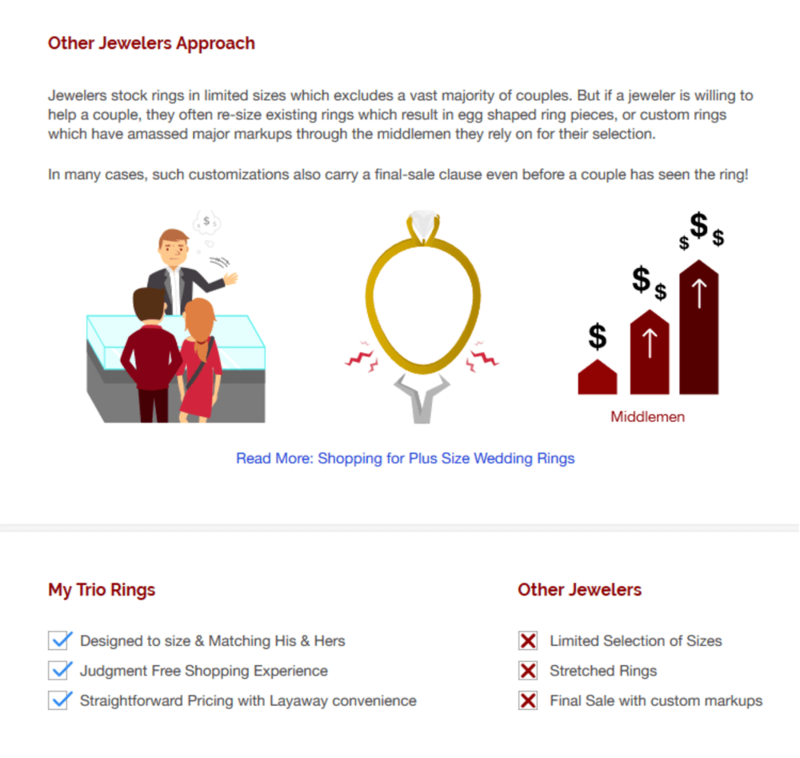 These aren’t size 7 rings that have been adjusted to fit size 11; these are especially designed to be beautiful size 11 wedding rings.” All of our rings come with matching wedding rings, so couples can choose exactly what they want." True to My Trio Ring's direct to couples pricing, all Full Brilliance wedding rings come without retail store markups or "custom size" fees that many jewelers charge otherwise! Rings are crafted with real diamonds and gold; you don’t have to sacrifice quality or authenticity to have a ring that fits. Rings are custom-designed for sizes 11+ – they look flawless in the size you want, never stretched out, too thin on the sides or sparsely adorned with diamonds. The collection showcases a huge variety of styles and price points, ensuring you find exactly what you want on your budget. Summer 2018 marks the collections official launch and more styles will be added in shortly.